Advocacy for the arts has been one of the central topics of the meetings and research activities of IETM. These essays reveal the challenges and peculiarities of advocating for the arts in today’s reality. The second essay, "Governing a 'Creative' City", can be found here. It’s a Monday afternoon in early September 2018. Berlin’s light is getting greyer after a hot and dry summer. We enter a wide room on the fourth floor in Brunnenstraße, in Berlin-Mitte, sprinkled with dark-grey, red, and yellow chairs, reminiscent of the German national colors. On the walls are black-and-white posters of the historical Café Moskau in former East Berlin, just off Alexanderplatz, alluding to the city’s torn past, split into East and West and their respective cultural worlds. Accidental or not, both decorative color schemes in the office quietly speak to the theme of the conversation to come: Berlin’s position as a European and international capital of culture; a “creative” city, a place where artists increasingly act as agents of political and urban change. “‘Creative’ cities”—those that thrive on creativity and a culturally vibrant atmosphere—is a term coined by economic geographer Richard Florida. And while assuming that those cities put art and culture at the forefront of urban development, the term has been criticized because it could serve as a cover-up for neoliberal urban politics that treat art as resources or commodities. We have arrived in Brunnenstraße to speak with the city’s senator for culture and Europe, Dr. Klaus Lederer from the Left party, who has been in office since late 2016. It was before Lederer’s entry into office, however, that the city’s cultural political terrain was significantly reshuffled. The emergence of a new collective in 2012—the Koalition der Freien Szene (Coalition of the Independent Scene)—gave voice to the “independent scene” in Berlin. Dr. Klaus Lederer (left) in discussion with Christophe Knoch (middle) and Dr. des. Friederike Landau (right) about the role of arts and culture for the development of vibrant European democracies. Photo by Tobias Rieder. The Koalition consists of an agglomeration of genre-specific associations—from visual and performing arts, literature and poetry, new music and jazz, as well as dance, cultural production, and artist-run project spaces—and manifests itself as a new form of artist activism. Its focus is on underlining how independent cultural workers contribute to the city’s image as open-minded, politically progressive, and creative—doing so by engaging in policy- and budget-making processes to advocate for the improvement of working conditions for Berlin-based cultural producers. 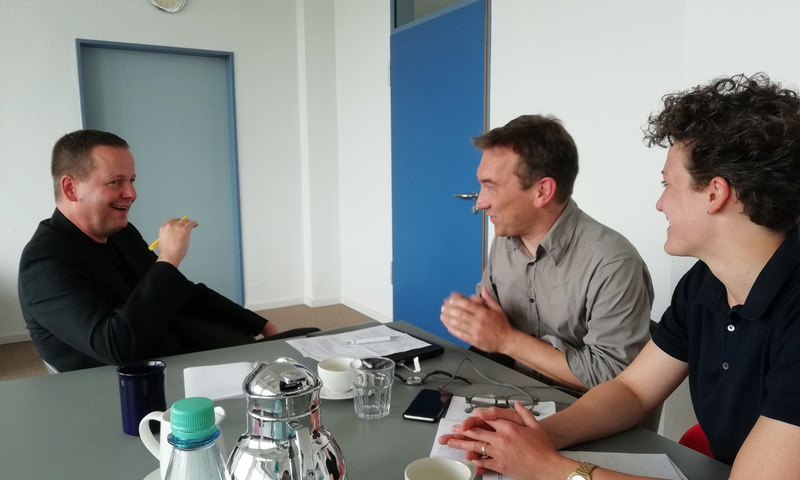 Through collaborations with policymakers from the cultural administration, the Koalition has contributed to creating concrete policy change for individual artists in Berlin. Informally represented by up to fifteen individuals who either come from professional arts organizations or are culturally and politically interested individuals, the Koalition advocates on behalf of the estimated forty- to fifty-thousand artists working and/or living in Berlin. The organization, and others like it, are what make Berlin as culturally diverse and vibrant as it is. Lederer’s official responsibilities are culture and Europe, a seemingly odd alliance. While cultural affairs had previously been dealt with under the roof of the mayor, since Lederer’s inauguration, cultural policy has been reinstated as an autonomous administrative apparatus. And because of the limited number of senate departments, culture was merged with European affairs. This fusion was not, however, simply a bureaucratic coup. Lederer makes it clear that it is emblematic for an understanding of culture as something embedded within social and political parameters. To foster and encourage cultural exchange in Europe (and ideally create social unity as a result of cultural exchange and liberty), Lederer places strong emphasis on “sensibilizing the cultural sector” as well as thinking of and integrating the dimension of European cultural exchange and mobility more strongly in the cultural funding system. More generally, this interrelation underscores and fosters an understanding of cultural production as a means of promoting, discussing, advocating for, and challenging European values such as diversity, a strong civil society, and the free exercise of cultural and political freedom. Lederer, and his new administration are trying, very consciously, to “interrelate cultural political questions with European political concerns” and engage in cross-European initiatives such as the Urban Agenda to learn from other cultural political contexts about experiences the cultural administration in Berlin might not (yet) have encountered itself. Fighting against the notion of Europe as a “community of isolation, as a fortress,” Lederer views some parts of Berlin’s cultural sector as actively engaged against right-wing backlash. In May 2018, for example, cultural organizations and clubs organized an anti-right-wing demonstration. In times where claims of national or European identities are partially appropriated by right-wing nationalist or populist parties or movements, artists and cultural workers can potentially provide a different kind of identity offer for artists to feel like they belong to, or even are co-producers of, socially diverse “creative” cities. Looking at the political and potentially progressive impact that can result from artists’ activism, Lederer demonstrates how ambivalent the term “identity” itself is: “On the one hand, identity-building can be something progressive and open-minded, and on the other hand, it can be exclusive and isolating.” Hence, appealing to a collective identity—creating a feeling of “we”—is not negative, per se, or defamatory. Similarly, lobbying or collective-interest politics should be evaluated on whether they enable dialogue, participation, and exchange of knowledge, or whether they are based on discrimination and exclusion. The Koalition has an objective to include rather than to exclude artists as agents in politics. With their self-empowered activism, the Koalition demonstrates how artists themselves can intervene in trying to shape the political parameters of their working conditions. The group claims to give a collective voice to independent cultural producers in the city and thus provides opportunities for artists to identify as Berlin-based artists, united by a common concern for the city (i.e. suggesting a local sense of belonging). More extensively, it showcases artists as enactors and claimants of European values such as participation, diversity, and the expression of cultural freedom (i.e. pointing to a European sense of belonging). According to Lederer, the sense of belonging to the Berlin art scene is very pronounced among local artists: “In my view, [their] self-understanding is a very progressive and open-minded one,” he says. “I perceive Berlin-based artist-activists as wanting to get engaged because they want to defend urban space against certain tendencies of authoritarian politics as well as against economization and marketization going on in the city.” For example, initiatives like the group Haben und Brauchen and Stadt Neu Denken have fought, and continue to fight, against the privatization of space used by artists, and try to “save” cultural initiatives that run risk of being evicted or can no longer afford rising rents. In times of increasing social fragmentation and polarization across Europe, in Berlin, and in other cities, cultural producers’ self-empowered engagement moves to the forefront. Lederer observes a growing internationalization of the art scene in Berlin: many artists working have international backgrounds and put on cultural productions that are inspired by diverse cultural, ethnic, linguistic, and religious backgrounds, reinforcing the city’s image as open-minded and multiple. While some artists might choose to leave their cities and countries of origins because of the drastic withdrawal of cultural funding support in times of austerity politics (e.g. Italy or Greece), the increasing unaffordability of workspaces (e.g. London or Paris), or civil unrest or war in their places of origins, others might have to flee marginalization and discrimination based on sexual orientation or ethnicity. In the face of these reasons, belonging to the “creative” city of Berlin might not so much mean integrating or fitting into something given (i.e. “the scene” as a monolithic and fixed entity), but rather belonging to an open place—be it temporary or long-term—where people can express themselves and engage freely, both with regards to artistic production and artistic activism. In Berlin, belonging could mean aligning with values of diversity, multiplicity, and the acceptance of disagreements, which will necessarily arise between artists and cultural administrators but which would not keep these actors from communicating with each other. In other words, a sense of belonging could be created if artists, or engaged citizens more generally, participated in the making of their own city. This promise of freedom may be inherent to the idea of co-ownership of cultural policy-making as a unique form of belonging. The notion of collaborative policy-making, however, could also extend far beyond the field of cultural policy and the profession of artists. Ultimately, enabling the substantial engagement and involvement in democratic decision-making of artists in particular, but maybe also engaged citizens more generally (as opposed to lip service or simulated participation) would potentially circumvent the emergence of populism, right or left, from occurring in European cities in the first place. In a place like Berlin, the concern for rising right-wing sentiments was triggered by remarkable gains of the right-wing party in 2016’s local elections. When artists articulate themselves as political actors, they set out to discuss the contested status of culture as a res publica (i.e. representing the common good). As culture cannot easily be defined as a tradable good or product, the meaning, value, and priority of it as a “public good” needs to be filled with meaning by artists, but also funds by policymakers across Europe. Bearing in mind that some European governments have heavily cut funding for arts and culture at national and municipal levels in the past years (e.g. in 2011 in the Netherlands), the political responsiveness on the side of Berlin’s cultural administration to increase support for the independent scene, and take them seriously as political agents, sends a positive signal to Europe and beyond. In other words, Berlin places culture high on the political agenda in times where social cohesion and the expression of cultural and political freedom might be in danger elsewhere. With this investment in culture and an openness to co-design policies alongside the individuals who are affected by these political decisions, Berlin could set an example for more political ways of policy- and decision-making. Lederer refuses the entrepreneurial, competition-, and marketing-obsessed notion of the “creative” city as a leading rationale for his cultural administration. In contrast, he values the access to cultural and aesthetic education from an early age (which needs more political support to be expansively incorporated in Berlin’s educational system) and the maintenance of cultural spaces as incisive indicators for what enlivens the particular sense of belonging to Berlin. While existing indicators in the city point to institution- and presentation-centric cultural budgets as opposed to temporary, individual-artist or project funding, the topic of space for cultural production reveals itself as the most urgent cultural political issue of the city’s current discourse. Endangered Spaces for Art = Endangered Spaces for Cultural Freedom? While Lederer views Berlin as an increasingly “interesting place for endangered artists, even from within Europe” because the city is still viewed as a place with free spaces to experiment with artistic ideas and projects, this freedom is increasingly in danger. Availability of affordable work spaces for artists is an issue, as those spaces are facing pressures induced by privatization and financialization of real estate, a stark influx of new Berlin residents, and a legacy of administrative leaders who failed to maintain city-owned premises for cultural use. If spaces for cultural production are not maintained, spaces for the expression of cultural freedom are in danger, too. While proactive politics forged by the Senate for Culture and Europe could respond to the international reputation that Berlin is a “creative” city with open and free spaces—and thus foster the growing and internationalizing art scene in the city—the question of space is also of utmost importance for Berlin artists who have worked and lived in the city for decades already. Securing and safeguarding the cultural infrastructures that these artists created and have run after the fall of the Berlin wall would acknowledge their specific sense of place and belonging in the city. Artist-activists and cultural policy-makers alike need to fight for maintaining both physical as well as mental and discursive spaces for experimentation and the long-term security to keep belonging to that creative space. Outlook: Artist-Activists as New Carriers of Res Publica Culture? Artists who take ownership of problems in their own city start to act as political agents part of a particular place, which creates a local sense of belonging. When artists promote and safeguard European values such as diversity and participation both in cultural productions and through cultural activism, they not only claim this belonging but also sketch out new models of political engagement that might be needed today to fight against growing right-wing populism, neo-fascism, and spatial displacement across Europe. Cultural activism in Berlin marks the radical opposite of political disenchantment and disillusion; the Koalition, in collaboration with an administration such as the Senate for Culture and Europe, constitutes a radically democratic alternative to doing politics in a top-down manner. At best, it challenges cities like Berlin to not only be pioneers in terms of free-spirited cultural production but also in terms of open-minded cultural politics and policy-making. This article was originally published on HowlRound on the 11th of October 2018. Read the original article. Friederike Landau holds an MA in Political Science (specialization Political Philosophy) from Brock University and is a current PhD Candidate in Urban Sociology at the Technical University of Berlin. After returning to Germany, she worked as a Strategy Consultant, engaging with urban development and contemporary art. In her dissertation, Friederike analyzes forms of political mobilization amongst Berlin-based artists and their influence on Cultural Governance. Since spring 2012, he has been the speaker of the independent art scene in Berlin and has been involved in many participatory political processes concerning urbanism, development of spaces, participation in decision-making, www.berlinvisit.org. He is artistic director of In Between Festivals, Berlin's participation on Wroclaw, Cultural Capital of Europe.